The recently formed Offaly Dyslexia Group has moved from strength to strength since its formation in Oct last year. We have had many successful meetings with parents and teachers over the past few months with members of the Dyslexia Association of Ireland coming down from Dublin to answer our many questions. Now with funding received from the EBS building Society, Oak Partnership, Mahon Oil and the Community Foundation of Ireland, we are now hoping to commence workshops for Children in Offaly with Dyslexia in the near future, for which we are presently compiling a pre-enrolment list of children who are interested in attending. The workshops will be held in Daingean National School on a Monday Night from 5-7pm and are for children over 8 years of age, who have been assessed and diagnosed as having Dyslexia and who are registered members of the DAI. There are a limited number of places on the workshops and any children who do not get into the first set of workshops will have their names placed on a waiting list for the next suitable place. If you are interested in your child attending the workshops please contact us on 086-6005606 / 086-8258511 or email info@offalydyslexiagroup.org for a registration form. We would like to thank all those who have supported us especially EBS Building Society, Oak Partnership and the Community foundation of Ireland, whose donations will go a long way to helping get our workshops up and running a lot earlier than was anticipated and provide a badly needed service for the children in Co Offaly. We would also like to thank the Board of Management and Staff of Daingean National School who have made the school available to us for the purposes of the workshops. We hope this is just the beginning; however, we would be delighted to receive any further help and support. EBS has confirmed that four local initiatives across Offaly that will receive funding from the new EBS Community Fund. EBS offices called on communities to ‘Make a Difference’ and nominate local initiatives worthy of receiving grants. It is a new fund which is available through EBS to help support causes in the local community. 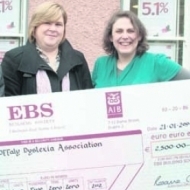 In total over €3,500 has been given through the EBS Community Fund to local community organisations in Offaly. The four groups are North Offaly Dyslexia Association, Tullamore Scouts, Kilcormac/Killoughey Camogie Club and 1st Edenderry Scouts. The groups being supported in Offaly are among 154 initiatives around the country chosen by a group of EBS members and staff who reviewed all nominations and decided on the causes to benefit from the fund. Venue: Glenroyal Hotel, Maynooth, Co. Kildare. Date: Saturday 25th April, 2009. The 2009 Annual Conference, incorporating the AGM, will take place on Saturday 25th April, 2009. The Annual Conference will incorporate a range of programmes for different groups. There will be two strands: talks for parents and teachers, and separate talks for adults who have dyslexia. We are very pleased to announce that noted author and dyslexia expert Philomena Ott will be the keynote speaker at the conference. Philomena is author of many books including “How to Detect and Manage Dyslexia” and “How to Manage Spelling Successfully”. Further information and booking details will be sent to all members with the Spring 2009 newsletter which will be issued in mid-March.